After I took this photo I ate the entire bowl. I can always tell if a recipe in the Wall Street Journal weekend edition is decent to look at and maybe try because Cheryl will usually make a yea or nay comment like, “hey look at this” or “there’s nothing good this week.” A couple of weeks ago there was a featured a recipe on caponata, Cheryl saw it, and a not-so-subtle request for the Sicilian antipasta dish was made. What is caponata? Well according to the WSJ article it is ‘Sicilian ketchup,’ as in a go-with-anything condiment. In my opinion this is a very poor description, especially since the recipe they offered didn’t even have any tomatoes in it. I think it’s better described as a Sicilian version of ratatouille minus the peppers and zucchini (I dare the WSJ to call ratatouille ‘Provençal ketchup’), however, I find caponata is a little sweeter than ratatouille. 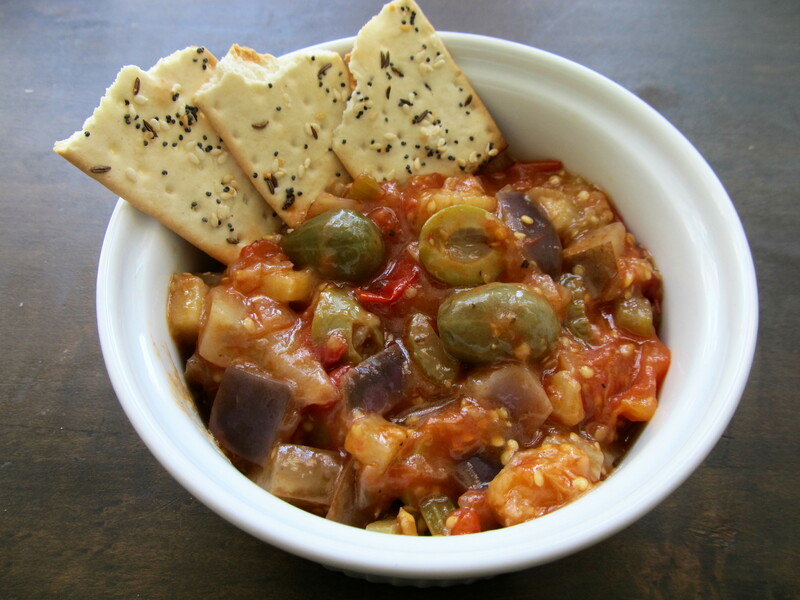 There are other differences between ratatouille and caponata of course, like the addition of celery, olives and capers, or pine nuts, or raisins, so it seems the Sicilians will make caponata with whatever they can get their hands on. If you do an internet search you’ll come up with a lot of different recipes, none of which are exactly the same but all are ‘nonna’s recipe’ (grandma’s). Anyway, at the most basic level, caponata is a type of tangy sweet and sour stewed vegetable antipasta that pretty much always has eggplant in it. ‘But wait a minute,’ you say, ‘you’re calling this caponaTINA, what’s the difference?’ From what I can determine…not a whole lot. Caponatina is either a milder version or a finer diced version depending on which way your web searches go or it’s just called either one. If you’ve traveled in Italy this should all make sense as everything is regional and food in one village may be called something entirely different in the next village over. It is what it is, my mom’s recipe book calls this caponatina so that’s what I’m going with. It’s a good recipe too. But you know me, I made some changes. Instead of using canned tomatoes I used fresh ones from my backyard garden; used Sicilian eggplant instead of regular eggplant (why not? ); used large caper berries instead of small capers; and added some lemon juice and basil. Looking at the recipe I think the canned tomatoes are the reason why there’s a good amount of sugar added since canned tomatoes just aren’t that sweet. If you use fresh tomatoes you can get away with less sugar, or even none at all depending on how sweet your tomatoes are. I really like the bigger caper berries in the caponatina, in fact I’d even add more of them. These were so big they looked like olives. I’m going to get in trouble for this but I did enjoy watching Cheryl tuck into the caponatina and bite into a big caper berry, knowing full well she thought it was an olive. The taste confused her and she made quite a “what the…?” face. I smiled and said ‘caper berry’ knowing the question she was about to ask. After that tastebud surprise she commented it was a lot like ratatouille (see WSJ!! )…but that she liked this caponatina better. She had one small quibble: expected it to have more tanginess. I think that’s because the recipe only called for 2 Tbs of vinegar, which isn’t a lot. Then again maybe caponatina IS a lighter version of caponata! In a large pan over medium-high heat, heat 2 Tbs of olive oil and cook onion and celery for 10 mins., stirring often. Add tomatoes, capers, olives, vinegar, sugar, salt and pepper. Bring to a boil. Reduce heat to a simmer, cover and cook for 20 minutes. While the tomato mixture is cooking, place the diced eggplant in a colander and salt with 3-4 good sized 4 finger pinches of salt and allow to sit for 20 minutes. Rinse diced eggplant if too salty and drain. In a separate pan, heat 2Tbs of olive oil over medium-high heat. Add half of the eggplant and cook, stirring often, until tender, about 10 minutes. Spoon eggplant out of the pan and onto some paper towels to soak up some oil. Stir blotted/drained eggplant into the tomato mixture. Repeat with remaining oil and eggplant. When all of the eggplant is cooked and combined pour into a bowl, allow to cool, and then refrigerate until ready to serve. Serve with sliced, toasted bread. Thanks! I really like the big caper berries in it.